I can tell it’s spring-time just by the fact it’s been a month since I posted here. The weather has finally warmed up into summer like conditions and we are busy! It’s been nice not to worry so much about cold nights and our greenhouse transplants. It gives us more time for other things. 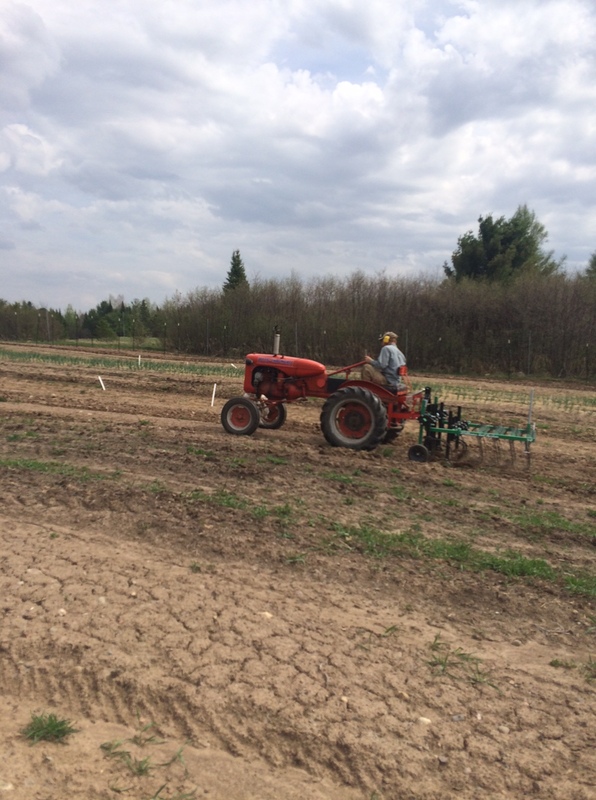 After some machinery issues all of our tractors are working well and we are getting the fields cultivated and ready for planting. Brendan was able to get into the fields early to spread lime and some trace minerals like calcium, boron, and a few more. He also built our raspberry trellis system, so we are ready for the raspberries to come at the end of the month. I have been spending most of my time in the greenhouse. Seeding, watering, potting up, and fertilizing. The plants need a lot of attention. 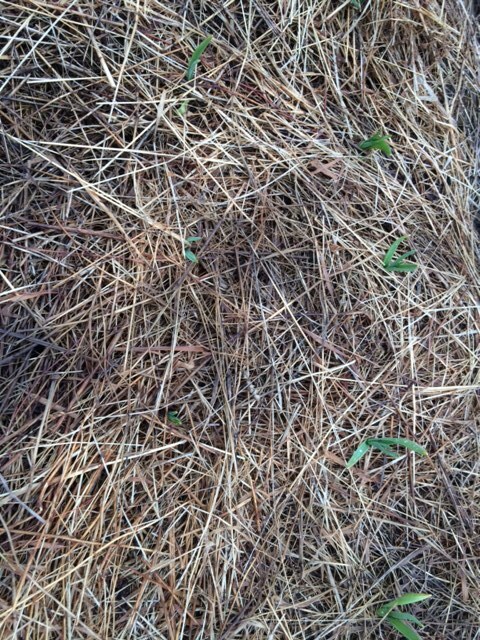 I’m also trying to get our asparagus patch weeded before the perennial weeds get too big of a hold. The CSA is basically full and we are thrilled. We have a couple full shares left and we expect to close the sign-up very soon. It’s so great to see members returning year after year. We love the support our community gives us. 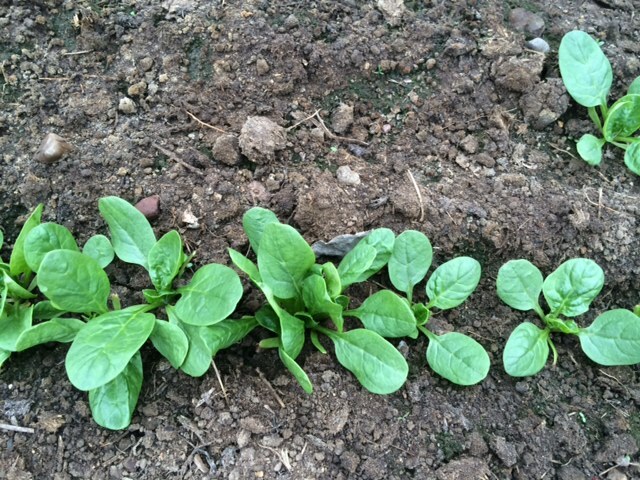 It looks like I’ll start going to Eagle River Farmers Market next Wednesday with transplants, spinach, and asparagus. Stay tuned to Facebook for the most up-to-date information! Keep enjoying these warm temps! Potatoes are one of the most widely consumed vegetables, however not in their most healthy form…french fries. Not don’t get me wrong we all love a good french fry from time to time, but there are so many other tasty and healthy ways to enjoy your spuds. Here at the farm we usually grow a big rainbow of potatoes. We’ve tried blue, purple (my favorites), fingerling, a knobby one called warba, and your traditional white and reds. We like growing mostly heirloom type potatoes since we think their flavor is far superior to hybrid ones. 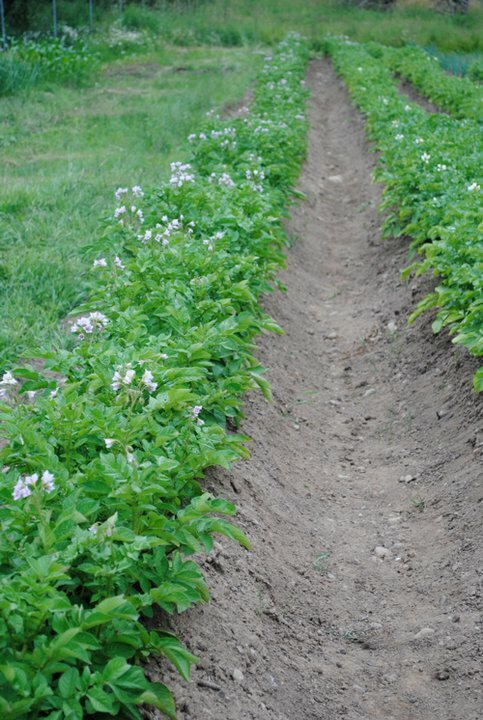 Potatoes are a relatively easy crop to grow, you plant them, keep them weed free, and then hill them as the plants get bigger to keep the potatoes in the dark. Our biggest problem with potatoes are potato beetles. They love to eat potato plants and will decimate an entire crop if left to munch. We aren’t a fan of any of the sprays (even the organic ones) so we pick them off by hand every few days…a task that I think Emmett will excel at this summer. While potatoes are a starch and probably shouldn’t be consumed in large quantities, potatoes are low in fat and rich in micronutrients like vitamin C, you B vitamins, potassium, phosphorus, magnesium, and folate. Potatoes store best in a cool dark location away from onions. Wash only before you plan to use them. If there are any green parts peel or cut these away. 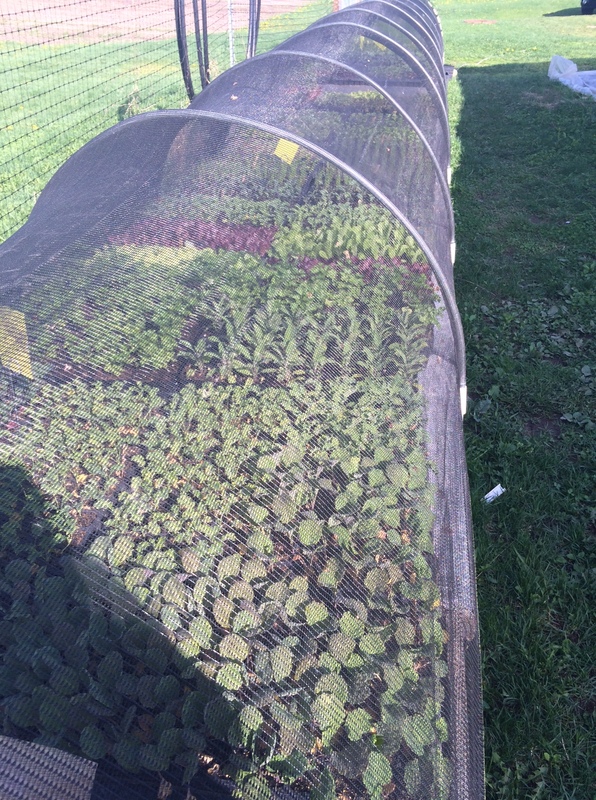 Yesterday, Brendan and I spent a good part of the day seeding and potting up transplants. 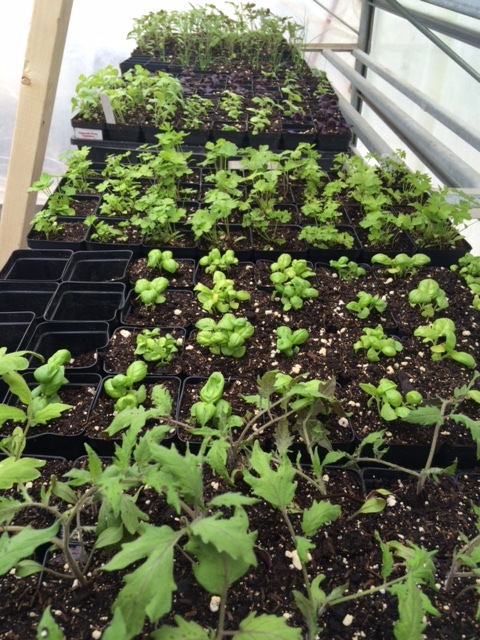 We potted up tomatoes, peppers, basil and other herbs. It was great to work in the greenhouse since it was still a little chilly outside, but nice and warm inside. The plants are looking beautiful and are thriving in the natural light. So far this spring seems to be shaping up better than last year despite a few snowstorms. 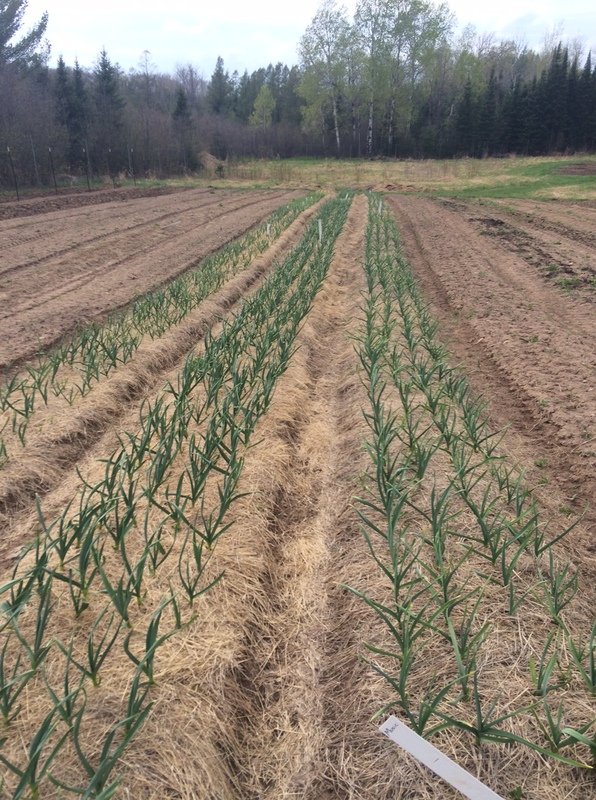 All the fields are clear of snow, the pond is full, the garlic, and rhubarb are starting to grow and my crocus keep on growing through the snow. 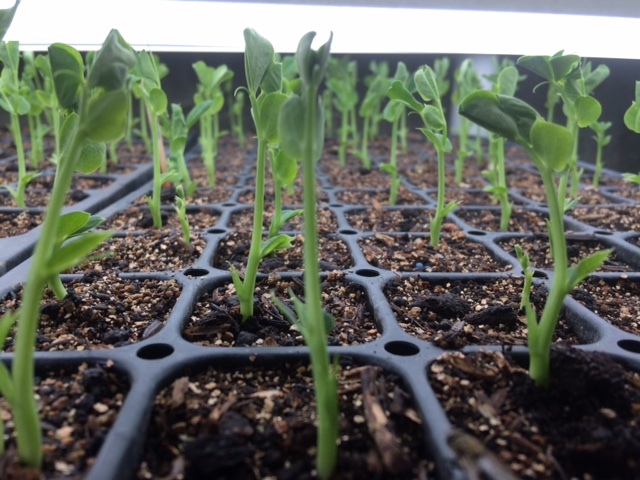 We are hoping to be on track for planting our first peas and greens soon. Let’s just hope that snowstorm on Monday was the last one and we start getting some warm sunny days soon! It’s starting to look like spring here at EverGood. We’ve dusted off our rainboots and have started outside work finally! 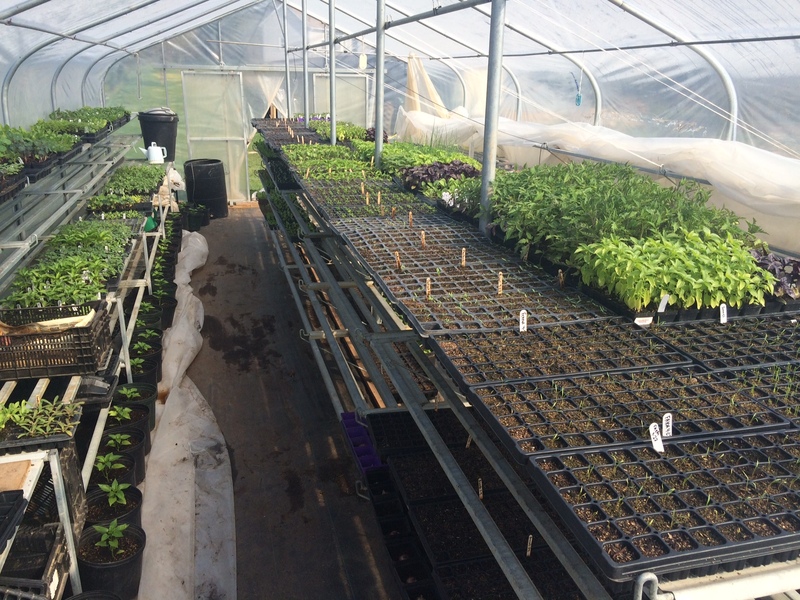 We had a beautiful little warm spell a couple of weeks ago and the weather seems to be improving so we have been able to do some greenhouse repairs, add more mulch to some of our perennials and finally see the soil in the fields. Almost all of our snow piles have melted and we are well into our spring seeding in our basement under the grow lights. Next week we will be turning on the pellet stove in the greenhouse and moving trays out there since we won’t have anymore room in the basement. 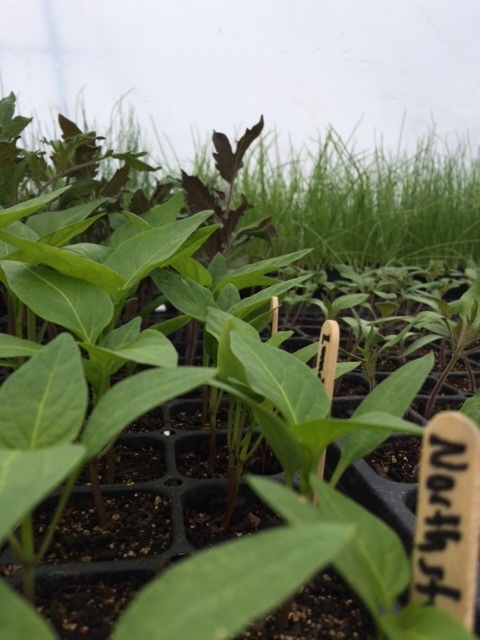 All the seedlings are growing beautifully and we will begin potting up our Vegetable starts next week too! Our members are starting to get spring fever too and are starting to crave our fresh veggies again. We have seen a big jump in memberships these last few weeks with the spring warm up. Sign up soon to avoid dissapointment! This weekend we all piled in the car and drove to La Crosse for the MOSES Farming Conference. Our heads are bursting with all the new ideas we picked up and we are excited for the upcoming season. Margie from Miss Margie’s Farm, and our loyal volunteer Debbie both came along for the ride. Allison also flew in from Colorado. This gave us the ability to all go to different workshop sessions so we could learn as much as possible. Our favorite workshops were about bio-intensive agriculture, flower farming, organizing your packing house, medicinal herbs, and how to get more out of your hoophouse. It was great to see so many (were are talking over 3000) people at the conference. There were a lot of new and beginning farmers and college students looking to start a career in organic farming, which is super exciting since we need more farmers! This week back at the farm it is snowing hard and we are looking at another 3-5 inches. 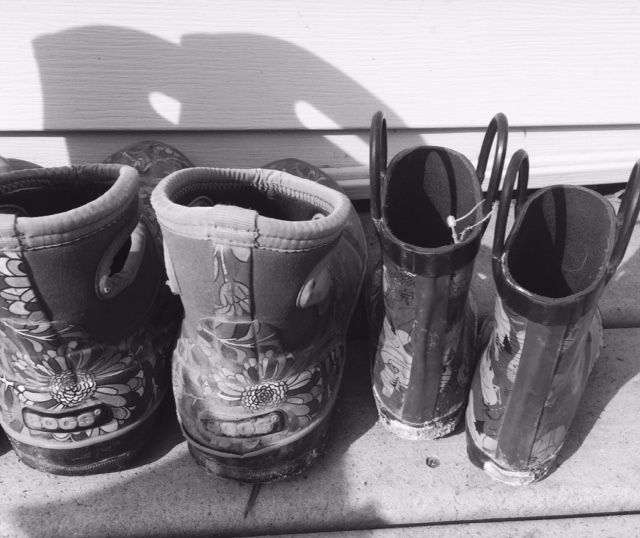 We can’t wait to finally getting outside to play in the snow! The temperatures seem to be warming up a bit, which is exciting. We will be starting our celeriac, basil, and some flowers this week under grow lights. Sage planting, CSA day, and conference time! Things have been pretty quiet here at the farm since it’s too cold to get outside. CSA memberships are coming in and we are about halfway full. We expect to be full by April. It’s great to see some new members and all of our loyal returning members too. We have been researching and planning some better ways to grow tomatoes and broccoli type crops as well as ordering seeds and bulbs. Next week we will start seeding the early crops and basil so we have some large transplants to sell at the first markets. I cannot wait to start digging in the dirt. In fact Emmett and I started last week when I decided to turn my sage plant into new cuttings. 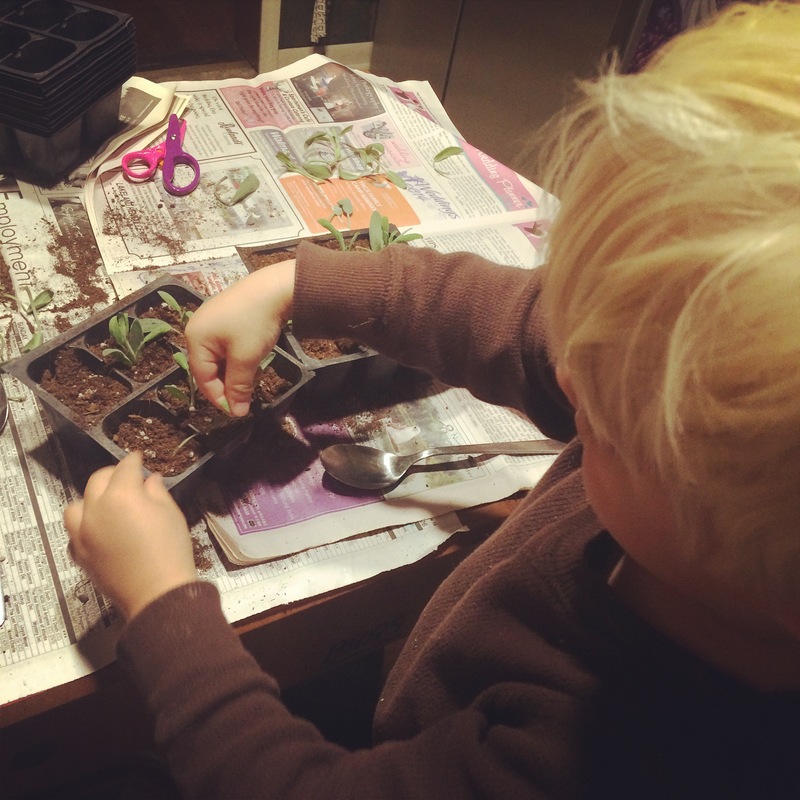 Emmett and I planting sage cuttings. 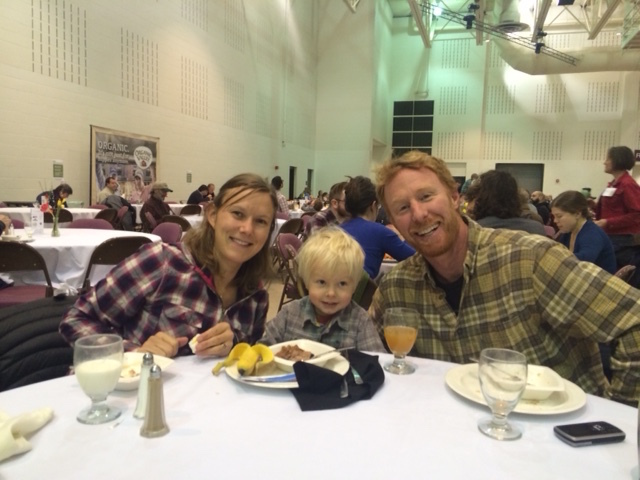 We are gearing up to head to the MOSES organic farming conference in La Crosse this weekend. We will be road tripping down there with Margie of Miss Margies Farm, and Debbie one of our loyal farm volunteers. We will also be meeting Allison there! We hope to come back with many new ideas and plans. This Saturday is National CSA sign up day. Turns out this is the most popular day to sign up for a CSA share and some people have decided to make it a holiday. We thought it would be a great idea to join in too. Facebook makes it easy to sign up from our page, and you can also just hop onto our website and get signed up in a matter of minutes. It’s that easy to be a part of something big and also eat fresh healthy vegetables all summer. 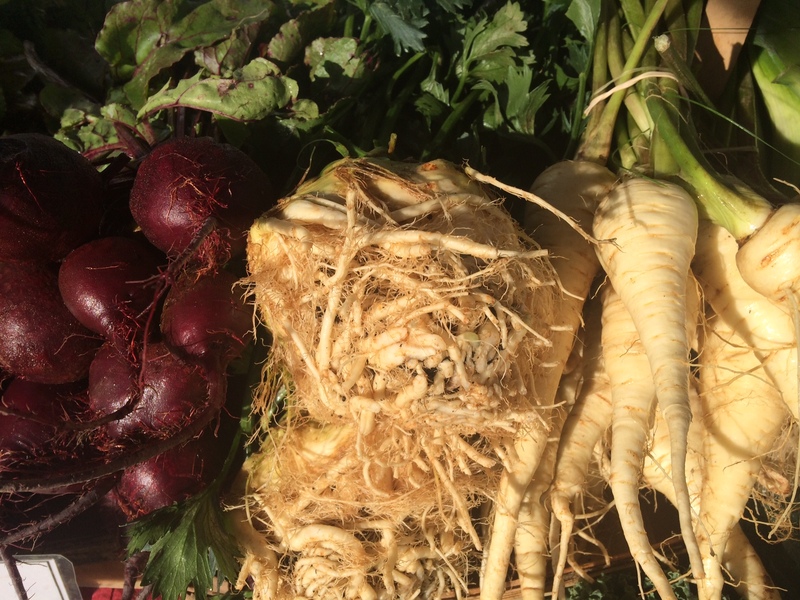 Don’t live near EverGood Farm…Click here to search for a CSA near you. Here is the press release for the National CSA sign up day.